This package is designed for intermediate or experienced surfers who are in search of the perfect wave. 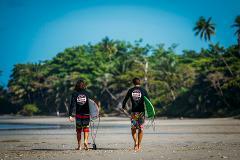 Selina Surf Club will guide you to the best spots where epic, uncrowded waves await. Surfers of all levels welcome! Selina Surf Club is for everyone, from seasoned pros looking to improve their speed and control to newbies just hoping to stand up for the first time. Can’t choose between the beach and the jungle? Get the best of both worlds! Get in shape and enjoy a surfing holiday, all in one dynamic experience! Like any sport, surfing is one activity you can continue to get better at with a little extra cross-training. Selina Surf Club is the perfect place for adventurers and surfers who want to get to know Central America on a whole new level.